What is Acne, what are its types & symptoms? Acne is a chronic disorder of the hair follicles and sebaceous glands. Some of the characteristics of acne include blackheads, pimples, cysts, infected abscesses, and rarely scarring. Acne usually occurs during adolescence in both men and women. To be more specific, acne starts during puberty and tends to get worse for people with oily skin. Acne badly affects teenage boys. 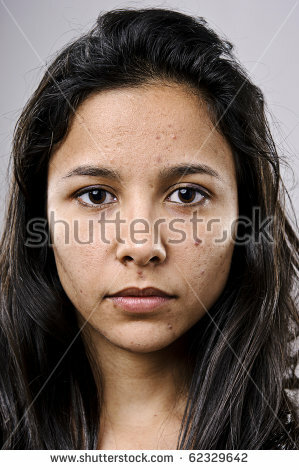 Only mild to moderate forms of acne occur in middle-aged women. Acne can be seen most commonly on the face. The other places where it can occur include the neck, chest, back, shoulders, scalp, and upper arms and legs. Most forms of acne are the result of heredity and hormonal problems and has nothing to do with a harmful diet or poor hygiene. Acne starts in a similar way for all but can take different forms and can react in a unique way according to the body conditions of the individual. A basic lesion called the comedo is the beginning of acne. The comedo is an enlarged hair follicle plugged with oil and bacteria residing under the surface of your skin, that waits for the right conditions to grow into an inflamed lesion. Whenever the skin produces more oil, the bacteria grow within the swollen follicle. The surrounding skin becomes increasingly inflamed as your white blood cells fight against the intruders. Two main types of acne include non-inflammatory acne and inflammatory acne. If the plugged follicle stays below the surface of the skin, the lesion is called a closed comedo. This usually appears on the skin as small, whitish bumps. This condition is otherwise called as a whitehead. If the plug enlarges and pushes through the surface of the skin, the lesion is called an open comedo. The dark appearance of the plug is not due to dirt, but due to the buildup of melanin, the pigmentation element of the skin. This condition is otherwise called as a blackhead. These are small round lesions that are inflamed and contain visible pus, which appears red at the base with a yellowish or whitish center. Pustules do not contain a large amount of bacteria. The inflammation is caused by chemical irritation from sebum components such as fatty free acids. This is a rare but serious form of inflammatory acne that develops primarily on the back, buttocks, and chest. In addition, to the presence of pustules and cysts, there may be a severe bacterial infection.